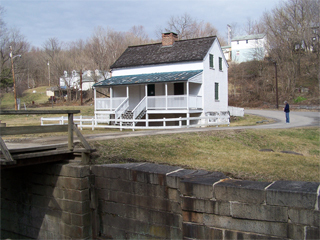 The Lander area has a restored lock house, a boat ramp, and provides access to the Catoctin Creek Aqueduct, approximately .5 miles upstream. The aqueduct is being restored through a cominbation of federal and private funds. The boat ramp has a small parking area. It's a popular spot for small boats and bass fishing. Directions: From I-70 take exit 52 to merge onto US-15/US-340 west. Take the Lander Road exit. Left at Lander Road, right to stay on Lander Road. Bear right to cross the railroad tracks. Left onto the the Chesapeake and Ohio Canal path. Right to the Canal Lockhouse. Cross the wooden bridge over the canal to get to the boat ramp. 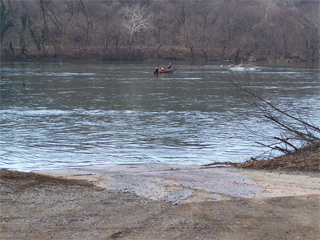 Below is a photo of the Lander boat ramp on the Potomac.